Q-Connect Thimblettes Size 00 Red (Pack of 12) KF21507 Pack of 12 Q-Connect Thimblettes. 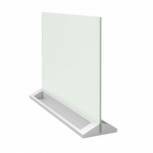 Manufactured from high quality rubber and ideal for note counting and similar office and factory work. Size 00. Colour - Red. 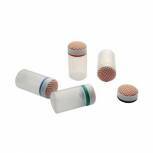 Q-Connect Thimblettes Size 0 Green (Pack of 12) KF21508 Pack of 12 Q-Connect Thimblettes. Manufactured from high quality rubber and ideal for note counting and similar office and factory work. Size 0. Green. Q-Connect Thimblettes Size 1 Blue (Pack of 12) KF21509 Pack of 12 Q-Connect Thimblettes. Manufactured from high quality rubber and ideal for note counting and similar office and factory work. Size 1. Blue. 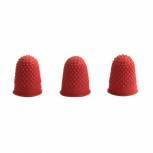 Thimblettes Size 00 (Pack of 10) VL20303 Pack of 10 Made of high quality pliable rubber. Size 00. Pack 10. Q-Connect Thimblettes Size 2 Yellow (Pack of 12) KF21510 Pack of 12 Q-Connect Thimblettes. Manufactured from high quality rubber and ideal for note counting and similar office and factory work. Size 2. Yellow. 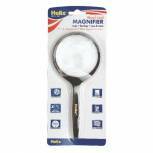 Helix Hand Held Magnifying Glass 75mm MN1020 Pack of 1 Magnifying glass with bifocal magnification feature. Scratch resistant lens. Lightweight for portability. 75mm lens diameter. 2 x magnification with a 4 x magnification insert. 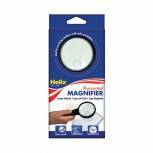 Helix 75mm Illuminated Magnifying Glass Black MN1025 Pack of 1 Helix Magnifying Glass. 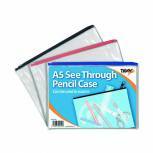 75mm magnifying glass with illuminated function ideal for use in poor light conditions. 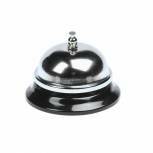 Q-Connect Reception Counter Bell KF01293 Pack of 1 Classic design nickel plated counter bell. Ideal for any retail outlet, reception area, office or bar. Q-Connect Tally Counter Chrome KF10860 Pack of 1 Q-Connect tally counter. 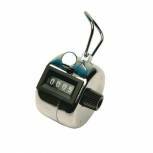 Hand held tally counter with easy to operate push down buttons to register the count. Counts from 0 - 9999. Reset by turning the knob on the right in a clockwise direction. Fits snugly in palm of hand. 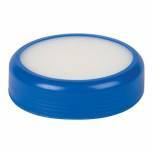 Q-Connect Sponge Damper 85mm Blue KF15024 Pack of 1 Q-Connect Sponge Damper. Hygienic and time saving. Ideal for bulk mailing. Small round tray with sponge head. Plastic moulding. Size 85mm diameter x 23mm height. Blue. 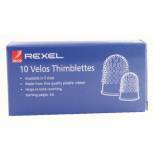 Thimblettes Size 0 (Pack of 10) VL20304 Pack of 10 Made of high quality pliable rubber. Size 0. Pack 10. Envelope/Label Sponge Headed Moistener (50cl Capacity) Y0604 Pack of 1 Convenient non spill moistener for envelopes, stamps, labels etc. The reinforced sponge head unscrews from its clear pliable plastic container for refilling with water. Clean and hygienic. Size 40mm diameter x 80mm long. Water capacity 50ml. 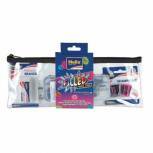 Helix Assorted Nylon Pencil Case 200x100mm (Pack of 12) Q65040 Pack of 1 Helix Nylon Pencil Case. 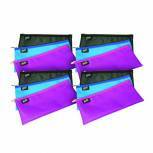 3 assorted colours - black, blue and pink. W200 x H100mm. Pack of 12. 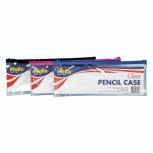 Helix Clear Pencil Case 200x125mm Assorted (Pack of 12) M77040 Pack of 1 Easy to Use. Simple and Effective. Easy on the eye as well as robust. Formulated from hardwearing materials. 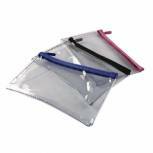 Transparent..
Helix Clear Pencil Case 330x125mm Assorted (Pack of 12) M78040 Pack of 1 Pencil cases for stationery storage. Clear plastic: ideal for exams. 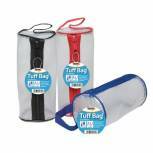 Zippered tops for secure storage. Tops available in assorted colours. Size: 330x125 mm. 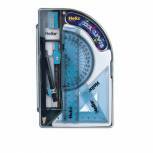 Bulk pack of 12: ideal for schools and groups.